Catering for beginners and intermediate ability dancers in a friendly and helpful atmosphere. Join in at your own pace. 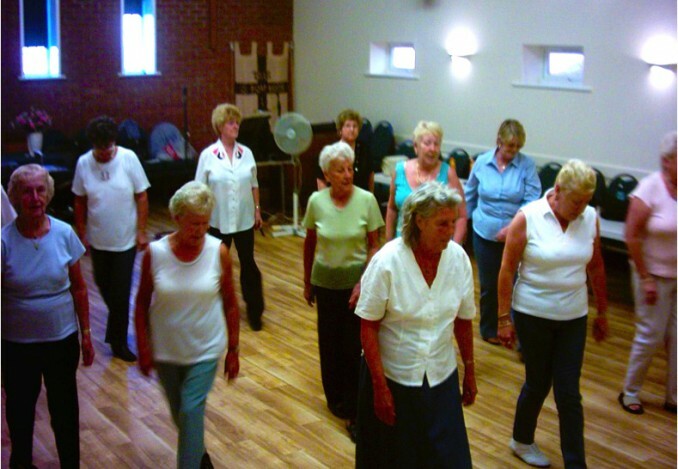 Line dancing came about at Crownway after a survey was carried out at an afternoon Tea Dance during the Open Week activities of October 2005. Visitors to the centre were asked what kind of activities they would like the centre to make available. Line Dancing was a popular request. The Thursday evening sessions are presented by Crownway representative and local guitar & vocalist, Gordon Blackburn who had already begun providing the Tea Dances at the centre. Although a complete novice as far as line dancing was concerned Gordon started the first sessions with a few CD’s and an instructional line dance video on the big screen with everyone following the steps. Some of the dancers who had previous experience suggested some of their favourite dances and kindly provided CD’s and step sheets and we all help each other which makes for an enjoyable learning experience. We are now quite proficient at dancing ‘Black Velvet’ ‘Boot Scootin’ Boogie’ Smokey Places’ ‘Islands In The Streams’ and ‘Waltz Across Texas’ to name but a few. Gordon also provides some ‘live entertainment’ with some alternative songs which fit the tempo of the routines and gives the dancers an opportunity to sing along to some pop songs and golden oldies. All are welcome to come along and enjoy the experience which is also good exercise.